Toshiba has announced that its new Satellite laptops will be available in the UK in late July, with the A500, U500, L500 and L550 all due to arrive on these shores. Toshiba's popular Satellite series has been developed, we're told, to offer personal computing solutions to suit different consumer needs. Those groups include everyone from the casual everyday user to those demanding entertainment and multimedia computers. The latest Satellite ranges, announced back in June for Europe, are billed as energy efficient and include multi-touch control pads and individual styling. The 16 inch 16:9 Toshiba Satellite A500 features a TruBrite display, and 1366x768 resolution screen – fitting for its role as a multimedia powerhouse. All models feature Harmon Kardon stereo speakers, Super Multi Dual Layer DVD (no Blu-ray) and up to 500GB of HDD storage for its price of £599. The U500 range boasts is lighter and smaller - weighing in at just over 2kg and featuring a 1,280x800 WXGA 13.3-inch screen, and is also available for around £599. 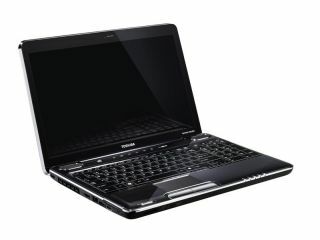 The cheaper L500 and L550 ranges are designed for "everyday, high-quality computing", with the former featuring a 15.6-inch 1366x768 screen and the L550 offering a larger 1,600x900 17.3-inch screen. Both of the ranges will offer a choice of 'stylish designs' with the L500 coming with an RRP of £449 and the much larger L550 available for £699.